Who wants to make decorating for Christmas a complicated affair? Ain’t nobody got time for that! 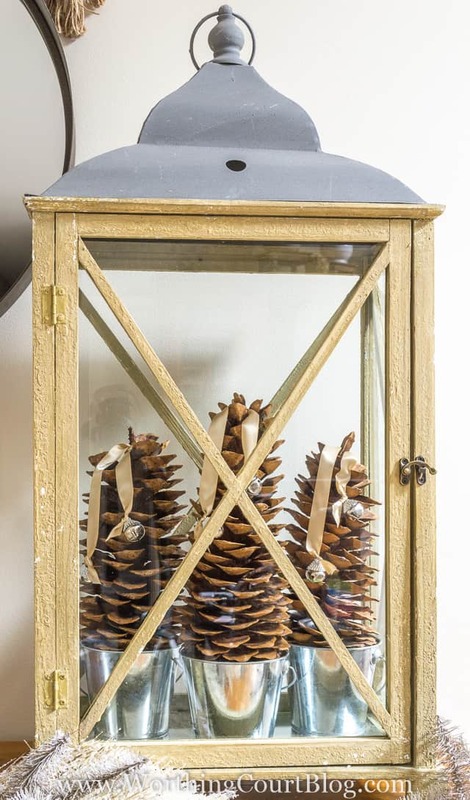 Let me show you how I put together a rustic-luxe Christmas lantern in 10 minutes. And part of that 10 minutes was spent gathering my supplies. The only things that I needed were 3 ginormous pinecones, 3 small buckets (or clay pots), satin ribbon and jingle bells (or small round ornaments). Step 1: Place a pinecone on top of a bucket so that it rests on the rim of it. Tie a length of ribbon around the middle of the pinecone, up at the top. You’ll have to excuse my reflection in this photo. Step 2: My jingle bells were in a garland, so I had to cut them apart, keeping longer strings on the bells that I wanted to use. Tie the strings together to form a loop so that you can run an end of ribbon through it. You can skip this step if you’re using individual bells or small ornaments. 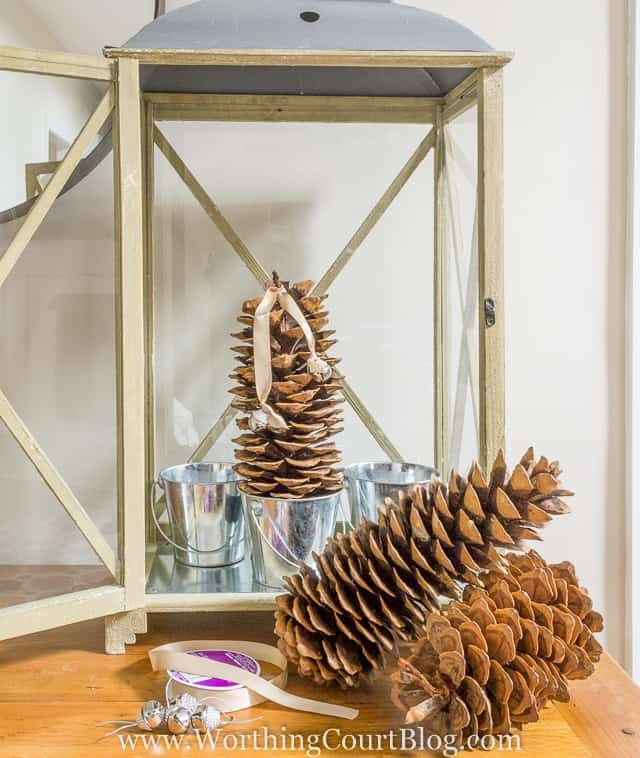 Step 3: Tie a jingle bell or small ornament to each tail of the ribbon that is tied around the pinecone. Cut the excess ribbon off. 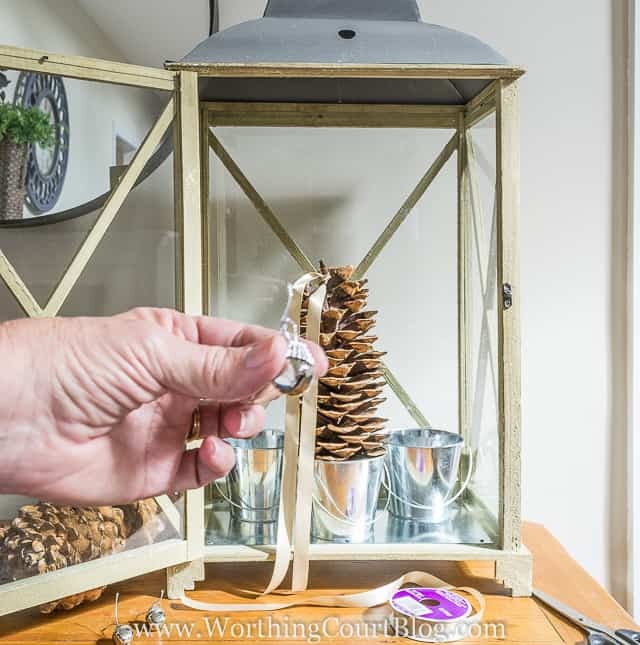 Step 4: Repeat the process with the other pinecones and arrange them in your lantern. And you’re done! Now that couldn’t be any faster or easier, could it? ….or display the lantern with the door closed. 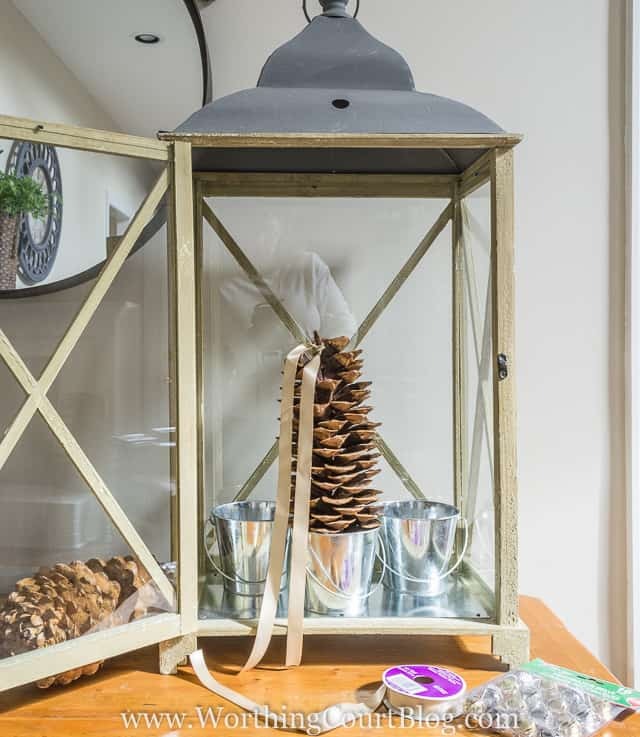 By the time that I had finished with my Christmas decorating, I had removed the pinecones from the lantern and used them on the open shelves in my breakfast area. With or without the lantern, I love them! IF YOU LIKE QUICK AND EASY CHRISTMAS DECORATING, PIN IT FOR LATER! What a great idea Suzy! It’s so simple and so lovely which is definitely my kind of craft! Love this idea! Natural Christmas decor is my favorite! So very pretty! Sometimes the greatest looking things that we do to decorate our homes are the most simple. Just love! This is such an easy and very pretty Christmas decoration. Now if only I could find a lantern that size. Thank you, Mary! I think that I got this lantern at HomeGoods. Do you have an At Home (formerly Garden Ridge) near you? I was just in there the other day and they had several large lanterns similar to this one. Hobby Lobby usually has a good selection too and they frequently have all their lanterns 50% off. Hope you have an excellent week! I love how cute and easy this is! Thanks so much for sharing at Share The Wealth Sunday! This is such a pretty Christmas project. 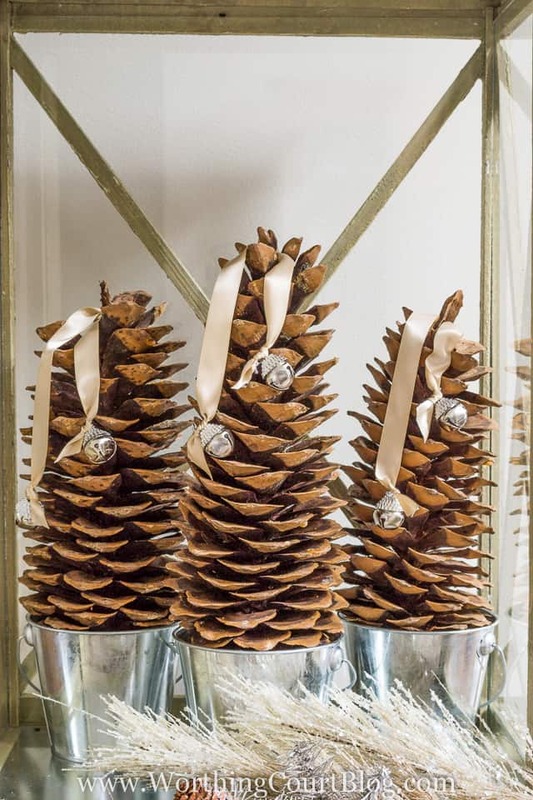 I love using pinecones for my Christmas decor also! Thank you so much for sharing at Turn It Up Tuesday. Look forward to seeing you again next week for another great party! Have a great weekend. I absolutely love this Suzy! It is so beautiful, peaceful and simple looking and I love incorporating things from nature in my decorating. Thank you so much for linking this up to the Bewitchin’ Projects Block party last week; you were one of my featured picks over at Recreated Designs this week. Very pretty and easy too. I was just in IKEA this morning and they have inexpensive lanterns too. I love your reflection in the glass, very normal, it’s hard to spot these things till the photo is up on screen at the editing stage! 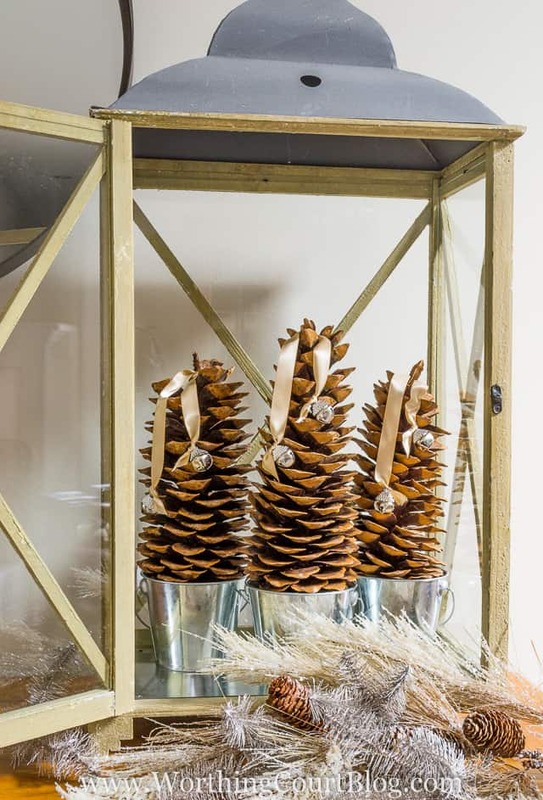 What cute little pinecone “trees” in buckets: first in lanterns, now on your new shelves! I had some similar buckets (from Target’s Dollar Shop!) a couple years ago. 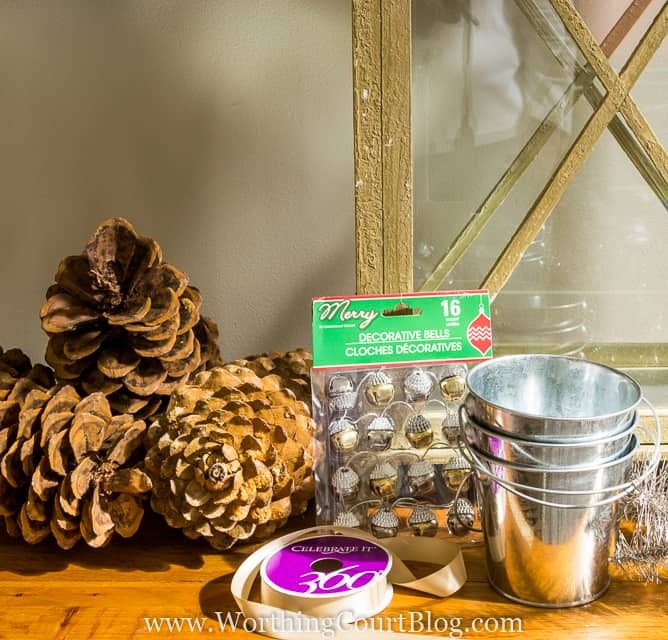 I put dried moss and 2″ or 3″ slim pinecones w/tiny star toppers in mine! You always have such great ideas to share, Suzy!!! Keep them coming, please ~ I need all the help I can get this busy Season! thanks so much for another great idea!! on the hunt now for large pinecones and a lantern! Have been searching them out….Happy Thanksgiving! Thank you for the link. You lantern looks great and easy to do. 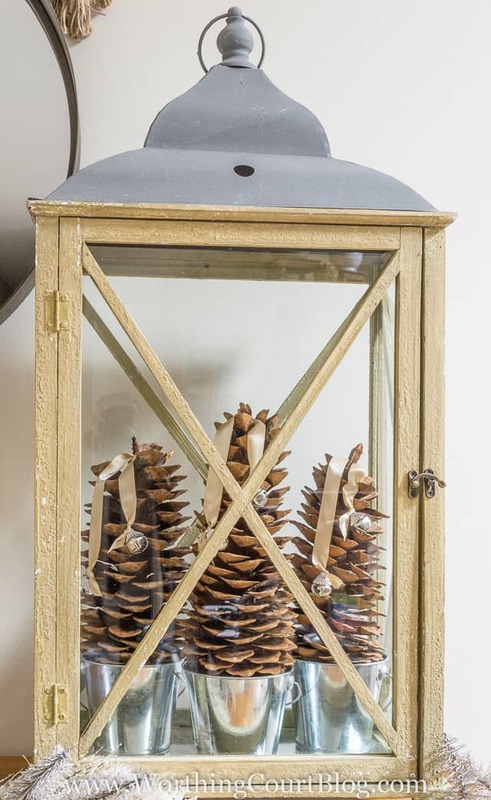 I love using pine cones. I love this idea! It’s simple, but looks great! Thanks for sharing! Omg that is so adorable. I love what you do with the lanterns. Thanks for the great ideas. I think I will now buy me a lantern I have been wanting for quite some time. Thanks again!! Love your home and porch. So much to see, took me few minutes to take it all in. Finally printed out some pages so won’t forget. What a fountain of inspiration you have provided. Seem to be doing my holiday decorating bit by bit cause keep changing my mind what I want to do, so many ideas to choose from. Trying to keep decorations sparse and very simple using what I have but not that easy when I see all incredible decorations bloggers have made, so impressive.